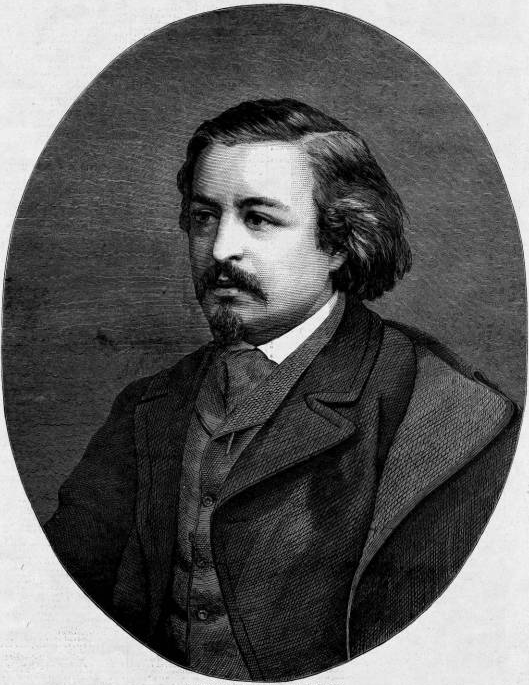 Thomas Nast (1840-1902), was an illustrator and cartoonist for Harper’s Weekly from 1857 (1862 full time) to 1887. In his 30-year career with the magazine, Nast drew approximately 2,250 cartoons. When Nast died in 1902, New York Times eulogized him as the “Father of American Political Cartoon,” an honorific bestowed in no small part for Nast’s scathing political caricatures of William M. Tweed who ran New York City’s Democratic political machine at Tammany Hall. Nast is widely credited for exposing Tweed’s corruption and Nast’s Tweed cartoons comprise the vast majority of scholarship about the artist and his work. It is from this visually enriched, scandal-ridden time period that journalism historian Thomas Leonard described as an era of “visual thinking.” Beyond the printed word, in cartoons, readers could see facts, suggested truths, and form opinions. During the Tweed era, Nast began the first of 46 cartoons about Chinese immigrants, Chinese Americans, and China-U.S. relations as subjects or themes for his cartoons. Seen as a whole, Nast’s 46 Chinese drawings align with Harper’s Weekly editorial position of inclusion and tolerance for all immigrants. Most historians, including Nast scholars, Morton Keller, John Adler, and Fiona Deans Halloran, among many, have defined Nast as a pro-minority and therefore a pro-Chinese artist. Few disagree that Nast contributed a rare, positive voice for Chinese American immigrants – setting him apart from the work of his peers. Consider, for example, the works of George F. Keller, cartoonist for The San Francisco Illustrated Wasp, an illustrated weekly magazine of “commentary and satire” (West). Keller often took cruel aim at the Chinese by exaggerating physical and cultural differences. Very little academic scrutiny focuses on Nast’s Chinese cartoons. The most comprehensive thus far, albeit a brief 15-page examination, is offered by historian John Kuo Wei Tchen, who concedes Nast’s overall sympathetic treatment of the Chinese in America. But Tchen correctly points out some grave inconsistencies where Nast lapses into negative Chinese stereotype. Tchen speculates that “Nast’s exposure to living and breathing Chinese and other racial groups was probably quite limited” (211). It is unknown if Nast ever met or associated with a Chinese person in New York. Reportedly only 200 Chinese were in New York in 1870 – or how he felt about them. Tchen suggests Nast represented what he knew or was told about the Chinese, rather from direct personal knowledge. Indeed, this would explain some of Nast’s unflattering images of the Chinese. From 1868 to 1886, Nast’s positive imagery toward the Chinese Americans ebbs and flows. What is apparent, is that Nast relished having a good villain to caricature, and where oppression and persecution of Chinese Americans were concerned, the ire in his ink easily pointed its nib to the Irish. Was Nast more motivated against those who attacked the Chinese, e.g., the Irish, (and politician James G. Blaine), than he was for presenting a case on behalf of the Chinese American as individuals? There is considerable evidence to assume that is the case. Given his progressive, Radical Republican philosophy, many of Nast’s artistic choices are indeed confusing. For example, Nast, a passionate abolitionist, offered the public a stirring portrayal of African Americans with “Emancipation of Negroes” drawn to shine the spotlight on the normalcy and assimilation of newly freed African Americans. A Chinese equivalent does not exist. Regarding the visual treatment of the Chinese in America, Nast did better than most in his profession. But, it is fair to ask why Nast did not more strongly advocate for the Chinese and refuse to repeat stereotypes. But as a nationally prominent cartoonist, his cutting, visual contributions, however flawed, succeeded in drawing national attention to post-Civil War anti-Chinese attitudes emerging as a political and moral issue. The paths of the Irish and Chinese immigrants in America often intersected. Nast paid attention to the significant conflicts between the two ethnic groups. When evaluating Nast’s treatment of the Chinese, a close examination of Nast and Irish Americans is warranted. Nast clearly saw the commonalities between the Irish and Chinese and their less-than-enthusiastic reception in America. In fact, Nast’s cause de célèbre exposed unfair oppression among all ethnicities and immigrants. When it came to unveiling the root of anti-Chinese sentiment, Nast identified the Irish as the lead oppressors. 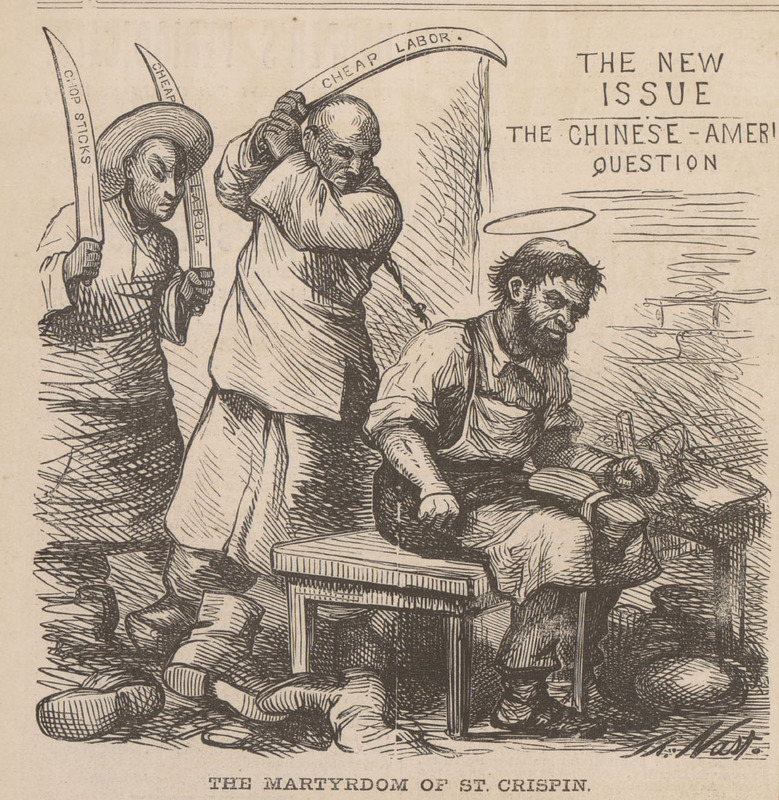 Thomas Nast turned his attention toward the “The Chinese Question” both as a cartoon title and for the common title of a much larger national discussion that surrounded labor competition. When Nast could link local anti-Chinese sentiment to Tweed and the Irish and their identity as Democrats, Nast was an effective advocate. Chinese Americans arrived at the Pacific coast of the U.S. in response to the Gold Rush of 1848. “Nearly all the immigrants who came to America were from the province of Canton.” The promise of riches propelled the Chinese to leave grim conditions in China that were both natural and man-made (Sorti 3). Like other immigrants, they came to America for a better life or the promise of economic opportunities. Resistance to the Chinese presence by white miners, many of whom were immigrants, was immediate. They initiated a string of local laws aimed to delegitimize Chinese miners and undermine any success the Chinese newcomers might seek to gain in America. Despite these hurdles and acts of violence to drive the Chinese out of western communities, the Chinese continued to arrive, encouraged by employment opportunities in agriculture and railroad construction, and compelled to flee from poor economic conditions in their homeland. 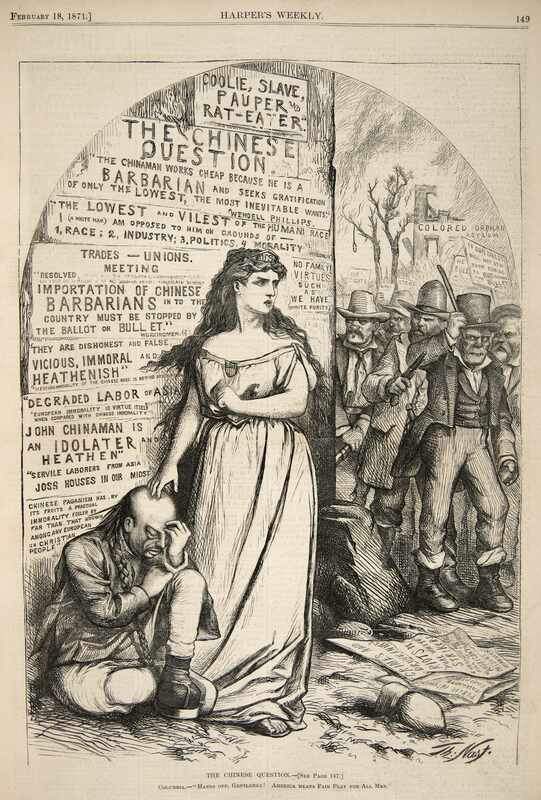 The official campaign to exclude the Chinese as a race accelerated in the 1870s when an economic recession in the United States heightened labor competition, culminating in acts of violence by white laborers in western states demanding that “The Chinese Must Go.” Cartoons helped make the argument to deny naturalization to the Chinese. A battery of specialized laws targeting Chinese immigrants quickly evolved. For a post-Civil War nation emerging from a culture of African American slavery, Chinese laborers in America quickly became suspect and incorrectly classified as forced labor – referred to as “coolies” and temporary visitors known as “sojourners” with no desire to assimilate. A national discussion percolated. “The Chinese Question,” which began and proliferated along the West Coast and eventually spanned across the U.S., asked Americans, in part, if the Chinese belonged. Anti-Chinese activists, the most well known of whom was the Irish-born American immigrant Denis Kearney, repeatedly stoked Sinophobic attitudes and organized white labor against the Chinese. His Sand Lot chants were reinforced with news coverage and imagery which depicted the Chinese as a people who endangered an American way of life. Defined as coolie slave laborers, carriers of diseases, and non-Christian “heathens,” Kearney and his followers warned that Chinese culture included opium smoking, rat eating and an inherent refusal to assimilate to American culture. In 1882, America answered the Chinese Question. The Chinese Exclusion Act, introduced several times in the late 1870s, finally became law, the only U.S. immigration legislation in existence that banned a race of people from coming to America. Nast paid attention to the proposed legislation and as talk of exclusion gained traction, Nast responded with some of his most passionate cartoons. Echoing his zeal against Tweed, Nast fixated on Republican James G. Blaine, a charismatic leader of his party and presidential hopeful. Courting the California vote, Blaine sided against the Chinese, and Nast relished his role to remind the public of Blaine’s hypocrisy. Fully aware of Nast’s leadership role in Tweed’s downfall, Blaine appealed to the artist and his editor at Harper’s, George Curtis to cease producing the cartoons. Nast’s pen would not be silenced. His cartoons played a role in Blaine’s unsuccessful presidential bids in 1876, 1880 and 1884. Blaine’s last attempt went as far as earning the Republican nomination. Blaine’s 1884 campaign, two years after the passage of the Chinese Exclusion Act, propelled both Nast and Harper’s Weekly General Editor George W. Curtis, to endorse the Democratic candidate Grover Cleveland. It was a startling departure from Nast’s beloved Party of Lincoln. Although Nast’s excoriation of Blaine cost the politician the presidency, Nast’s move to the Democratic side, albeit on moral grounds, significantly contributed to the artist’s loss of favor with his Republican base and marked the start of his downward trajectory at Harper’s Weekly. By 1892, 110,000 Chinese were in the United States (Pfaelzer). Nast expressed many views through his art. His attitudes on immigration and racial politics contributed to a larger discussion of “belonging” among America’s newest residents and how they were included in the national narrative. How did his status as a German immigrant factor in his depiction of other immigrants and minorities? Can his use of symbols and stereotypes be justified within the genre of cartoon satire? Did the technological limitations of his craft influence the repetition of these stereotypes? Nast began his professional career at the age of 15. He apprenticed at several publications, honing both his artistic talent and a growing acceptance of Protestant doctrine. In a weekly news magazine format, the current news could be delivered and accompanied with images. Photographs, however, could not be reproduced quickly as they can today— the week between publishing dates did allow photographs to be converted to steel plates for engraving (West). With multiple images, weekly illustrated magazines, unlike dailies, grew in popularity and complemented text-bound breaking news. At Harper’s Weekly, illustrations and cartoons, including Nast’s, were often drawn directly on woodblock (usually boxwood) or transferred from paper to a cross-cut section of woodblock, carved by engravers and set together with movable type on a printing press. Illustrations were drawn to scale, in reverse (known as relief printing). In relief printing, the areas not receiving ink — the white areas —meticulously carved out by a staff of engravers, leaving only the black lines in relief to press against the page. Watch a MOMA expert describe woodcut engraving. * See end note. In New York City, the most notable weeklies were Frank Leslie’s Illustrated News, the New York Illustrated News, and Harper’s Weekly, the latter being the most respected and prominent. In covering events “disastrous, tragic, or splendid, the visual element could substantially enhance the power of the written word” (Halloran 22). Nast had worked for them all — and in that order — but happily achieved his goal to work full time at Harper’s Weekly in 1862 (Paine 28). Harper’s Weekly and Harper’s New Monthly Magazine, (or Harper’s Monthly) were part of a much larger publishing empire known as Harper and Brothers, owned and managed by four brothers, James, John, Joseph Wesley and Fletcher Harper. Harper’s Weekly fell under the supervision of Fletcher Harper. As a publishing entity, the family empire “published books from American and European authors on a regular basis”(Halloran21) as well as school textbooks. Harper and Brothers enjoyed a national reach and the highest influence among New York City’s publishers. Among the city’s plethora of competitive weekly periodicals, Harper’s Weekly soon took the lead in feeding an “increasing appetite of Americans for news, entertainment, and literature” (Halloran 21). Harper’s Weekly tagline was “The Journal of Civilization” and its breadth of topics included local and national news, editorials, book excerpts, depictions of Civil War battles, arrivals of immigrants, politics, religion, biographies, political opinion, travel arts and culture both foreign and domestic. As a freshman illustrator, Nast covered harbor arrivals and fires in New York City. Assigned to cover the Civil War, Nast’s art matured and his popularity grew. He passionately advocated for abolition and the emancipation of African Americans and emerged as a stalwart defender of Abraham Lincoln’s Radical Republican policies. During the mid-1860s Nast’s illustrations were allegorical and lushly sentimental. After the Civil War, Nast ventured into political caricature and focused on the failed Reconstruction policies of Andrew Johnson, and in this genre of caricature Nast found his true calling. Henceforth, he rarely took his eye off of local and national politics, lampooning and exposing hypocrisy, corruption or fraud from anyone whom he viewed as antithetical of progressive Republicanism. In local politics, Nast implicated the Irish and Catholics as key enablers of Tweed’s corruption. Nast took particular exception to the Tweed-Irish-Catholic trio joining forces to interfere with the allocation of public funds in support of Catholic schools at the expense of public schools. Nast’s conviction that Tweed was corrupt, the Catholic Church was greedy and power hungry, and the perception of the Irish’s propensity for mob violence gave noble purpose to his cruel caricatures. Nast’s cartoons were brutal but powerfully delivered. His images of Tweed and the Irish and Roman Catholic Church in America are the most well known and studied cartoons of Thomas Nast’s oeuvre. Today, many seeking to explain Nast’s images, particularly those with an Irish-Catholic ancestry, often examine his cartoons out of their historical context and through a modern prism of political correctness and intolerance of stereotype. The interpretations of these images have changed as our collective refusal to tolerate stereotype has evolved. 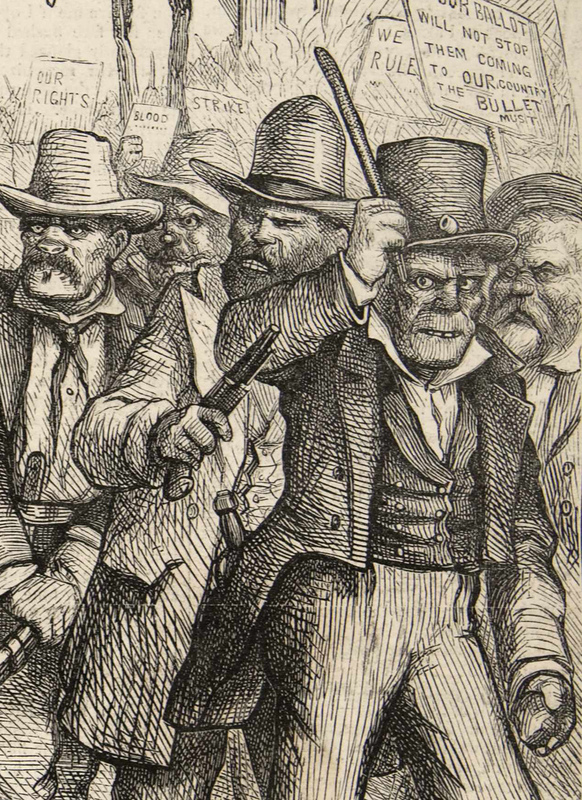 On the Internet, an abundance of public commentary exists–a collection of online voices who weigh in regarding Nast’s cartoons, images plucked from their historical context and presented as evidence of Nast’s strong bias against Irish Americans in particular, or on Nast’s inconsistent attitudes toward other minority groups in general. It is important to view Nast’s progression on this issue. The historical timeline of his cartoons and Nast’s biography must be considered when evaluating his views on race. Ansel Adams observed, “A photograph is often looked at, seldom looked into.” The same can be said for any art form, including Nast’s cartoons. Nast’s caricatures and illustrations contain multiple layers and experientially-formed opinions. These layers need to be examined. 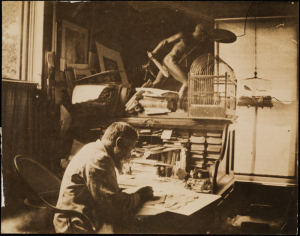 Nast loaded his cartoons with visual clues; contemporary newsmakers, literary figures, symbolism, and quite often, compelling narrative in the form of posters or placards framing his main subject. To properly analyze a completed Nast cartoon, one must peel back the many ingredients Nast purposefully included. They are clues that are often overlooked. Understanding these components illuminates the reasons for the ire in Nast’s ink. * I recommend clicking on the top right option to view the whole video. Don’t let the 8 hours scare you! Advance to the 17:00-minute mark to hear an excellent explanation of how Nast’s cartoons were carved. (A Nast engraving of the Tammany tiger is shown on the wall). Excellent! Worth every word. An educator’s dream tool. Thank you this Website has helped me so much in my report on Chinese immigrants. I think that it is very important that people know about what was going on during the 1880’s. Thank you Bella! I appreciate that! I found it fascinating too when I first discovered this part of our history. Good luck on your report! i want use your some cartoons image in our book”Pearson social studies” so i want know that there are public domain or need to be clearance these images. Images that indicate “Walfred” or “UD Scan” in the caption are in the Public Domain. They are scans I obtained personally from my university library and are not copyrighted. While I appreciate the site being referenced, it is not required. Where I have referenced other sources of images, e.g., The Ohio State University, or Library of Congress, please check with them. My understanding is all of Nast and Wasp cartoons are in the Public Domain, unless the source has a proprietary scan, such as Harp Week does, then permission is needed. These all appear with a Copyright watermark. I felt compelled to leave a small note celebrating your work on Thomas Nast. The excitement your words share through this topic led myself to read it in its entirety. I came across your work while on the UDel website and followed your work- to this. Well executed. Best wishes from a new fan. Katherine, Thank you so much! How kind of you to write! if I would like to use two cartoon images in my book. not labeled as Walfred/UD scan, as indicated in the Copyright notice. Hello, The scans that appear on my website were scanned by me personally from a book I own called the Illustrated San Francisco Wasp written by Richard Samuel West. I contacted Mr. West who stated the images were in the public domain, but nevertheless gave me permission to use the images on my website – I would double-check with them/him, for if you are using them in a book for sale, that might require a different level of permission – (my site as you know is free and I do not have ads, so my use of all images is also fair use under the educational condition) Contact Richard Samuel West through the publisher of the book info@periodyssey.com. I am fine with you using the scans I have created for my website. Thank you for your kind reply and providing valuable information. use the scans you created in your website is very much appreciated. Looking forward to receiving the reply from Mr. West. Thank you for your kind comments. I will let you know if there any progress.